If you are generating C-code in 20-sim and see that 20-sim 4C is missing in the targets lists, you have to add the target manually. The 20-sim 4C target is missing. 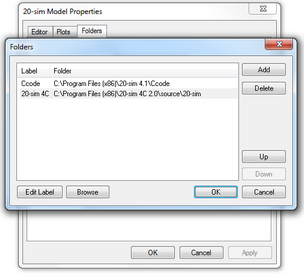 1.In the 20-sim Editor from the Tools menu select Options. 2.Click the Folders tab and click the C-code Folders button. 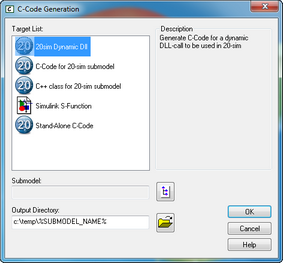 Add the 20-sim 4C code generation templates to 20-sim. •Did you select variables for logging in 20-sim 4C? •Did you select Run with Logging in 20-sim 4C? •Click the Configure Logging tab to see what filename and location you have chosen in 20-sim 4C. If the Configure button stays red, no connection could be made to the target. 1.Make sure the target is powered on. If a fatal crash has occurred, switch the power off for and after a few seconds switch it on again. Then try to search for an IP-address again. 2.Make sure you have a cross cable or network cable connected to your PC and your target. Check the Network section for help. If the Compile button stays red, compilation was not finished successfully. Check if the right target was chosen.